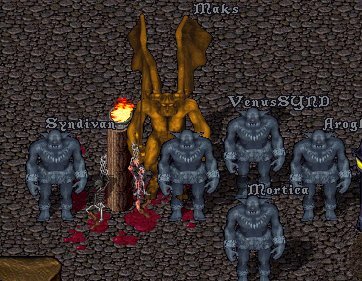 Halloween 2000 brought fun events to the worlds of UO and EQ. Verant didnt seem to have as much interest in doing something fun as OSI so there is less to talk about. The Syndicate, however, wasnt going to be deterred by that! 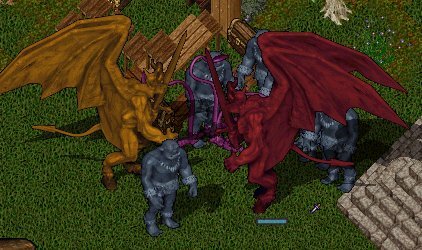 We held our own 5 day Halloween celebration in Norrath coordinated by Kaladam. 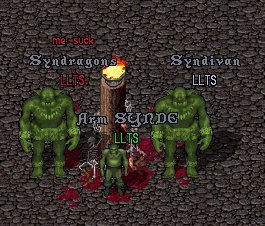 One night we took over Befallen (undead dungeon) just for kicks. Another night we did newbie runs through spooky dark forests at night. Another night we did an arena contest where members dueled each other in differnet level classes. That was a blast and many attended. And on the final night, Halloweem Night, Verant had a small event located in the West Karnas. They spawned a whole host of Werewolves that came in different shapes and sizes and skills. A Syndicate battle force headed there to combat them laying many of them low and ultimately participated in killing the "head" werewolf controlled by a GM. Lots of fun was had by many and Halloween 2000 was a 5 day event to remember in EQ. Over in UO, OSI announced it would open up a whole new server called the Halloween Server for 2 days. This server had alot of special things on it. First you could create your character and then edit their stats and skills to anything you wanted. Your bank was loaded with gold and items so you could arm up. Second, they had "gates" around the world that if you walked through them, you were turned into a monster. Third, they had colored pumpkins all over that you could use to "dye" anything you wanted including yourself. And Fourth, they had counsellors turned into Headless Horsemen you could roam the world killing (not to mention other halloween beasts like Haunted Heffers).